In recent years there’s been an ongoing debate in business circles regarding Leadership vs. Management. While the concept of visionary leadership has been trending positively, the once noble role of management has become somewhat maligned. But before you throw out your copy of (outdated management book name - any suggestions? ), let’s get past the semantics and cut to the core of which traits realistically help business owners get the best results from their team. Let’s begin this analysis by defining what we mean by “leadership” as it relates to modern business owners and CEOs. The late management guru Peter Drucker wrote, “The task is to lead people. And the goal is to make productive the specific strengths and knowledge of every individual.” In this regard, we will refer to private business owners or executives who are tasked with inspiring their direct reports - and consequently, the entire organization - as leaders. Convincing your staff that your vision is worth following is a key element. But rather than enforcing subordination, a gifted leader will seek to spread their message virally by empowering every department head to lead their own division with the same enthusiasm and dedication. Employees often emulate the values and standards they see displayed in the actions of their leaders, so creating a company culture of integrity and mutual respect will strengthen a company from the top down. To expound on the importance of respect, David Scarola, vice president of The Alternative Board, spoke to journalist Nicole Fallon for a recent Fox Business article entitled 5 Leadership Weaknesses and How to Fix Them. When did “management” become a bad word? In some ways, visionary leaders are portrayed as the new heroes of the modern business era. But every hero needs a villain and, as the management vs. leadership discussion gained traction in business articles, managers were often portrayed in a less than favorable light. In other words, being a mere manager was seen as unfashionable or tied to the past, while striving to be a leader was admirable. But is this just semantics and the evolution of business language, or is there more to it? Traditionally, many business managers ruled their subordinates based on fear and control, reward and punishment. As the psychology and technology of leadership evolved, the old ways became outmoded. Bosses who cling to the bully tactics of intimidation are becoming less common in the modern work environment. While it is still important, and natural, to have an established hierarchy within certain organizations, the methods of getting the best results out of your staff have become less draconian. 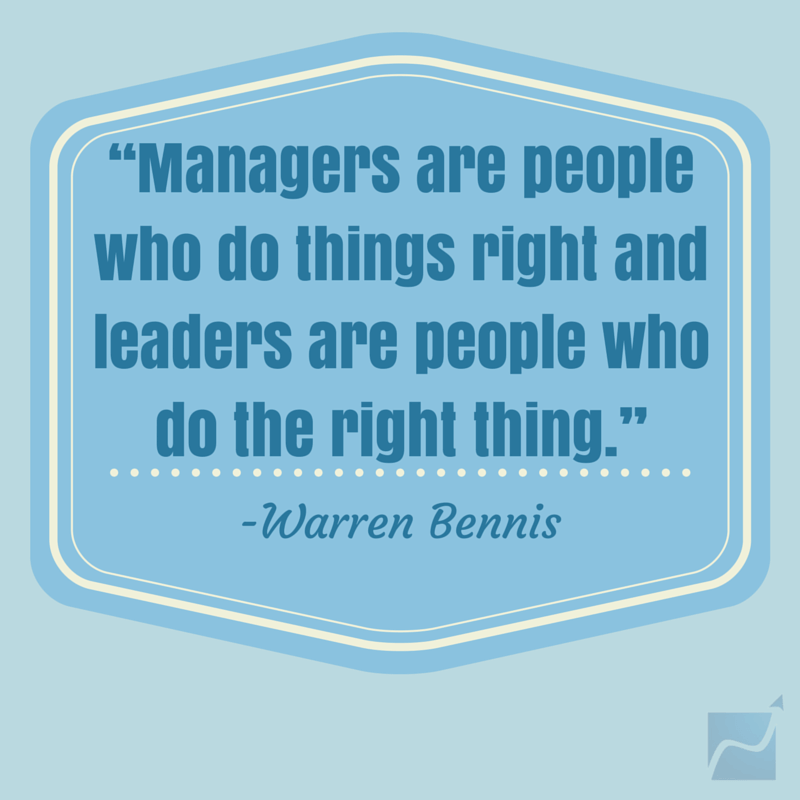 Certainly, managers are not all heavy-handed in the ways they impose their authority. In fact, a common managerial trait is the desire to not rock the boat. So for the purposes of this article, we will refer to managers as those who are appointed to a position of authority within a company and given a specific set of tasks to implement while overseeing a designated group of employees. In June, 2014, The Alternative Board surveyed 336 business owners to get a street-level view of what leadership actually looks like in practice. When asked what the most important trait was in terms of dealing with their employees, 63% of owners said their role was to inspire action. Yet when the same owners were asked which function matters most to running their company, 46% of participants identified accomplishing goals as most important vs. just 38% who said setting a vision comes first. In other words, the real leaders feel their role is to inspire the team, yet realize that all of the motivational speeches in the world won’t mean a thing if their team doesn’t ultimately see successful results. This illustrates how a hybrid of forward-thinking leadership traits and a proven managerial skill set is likely the best combination for business owners to both inspire and provide for their organization. 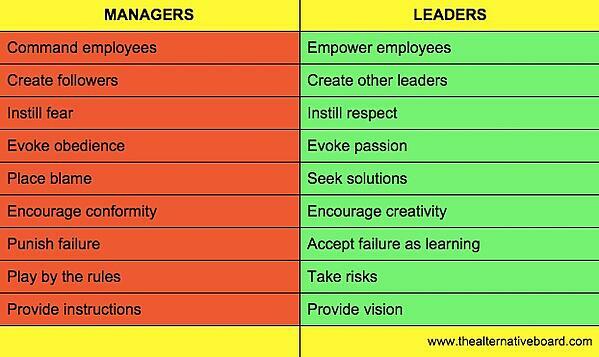 Management vs. Leadership: What are the dangers of becoming one at the exclusion of the other? While it’s obvious that eschewing modern leadership traits in lieu of an old-fashioned managerial style could put business owners behind the times, heading too far in the other direction has its drawbacks too. As Bob Sutton put it in the aforementioned article, “Some leaders now see their job as just coming up with big and vague ideas, and they treat implementing them, or even engaging in conversation and planning about the details of them, as mere ‘management’ work that is beneath their station and stature." Also, not every business will be perfectly suited to implement the most forward-thinking leadership strategies. For example, Drake Baer recently reported in Business Insider how leaders like Virgin’s Richard Branson followed the lead of Netflix founder, Reed Hastings implementing a policy of unlimited vacation time for all salaried employees. This comparison shows that in the leadership vs. management debate, there may be times where traditional, tried-and-true management systems work best in the short term. That’s not to say leaders should ever stop innovating and taking risks with potentially groundbreaking ideas. But as with many things in life, moderation is likely the key to finding the right balance between experimental leadership concepts and functional management practices. Visionary leadership is not an exclusive club limited to the top most members of organizations. It takes place at all levels, and can involve all people in an organization. If you’re looking for additional resources on ways to improve your leadership techniques, the four business owner books TAB founder Allen Fishman penned will open your eyes to new ways of successfully running a business. Better yet, explore how joining a TAB board will give you the benefit of learning from other business owners who know what you’re going through and know how to help you overcome obstacles to enjoy greater success!